Thia is going to be quick. Addie really needs to start sleeping through the night. I am so tired. Addison on Monday morning before her first day at daycare. Yesterday was Ryan's birthday. We got some takeout barbecue and celebrated at home. I think Addison was mad because Zack got to open up daddy's presents instead of her. Am I a bad mom for thinking she looks cute when she cries? I bought a Cold Stone Creamery ice cream cake with cake batter ice cream and red velvet cake. It was so yummy even though there was no chocolate. Ryan is a vanilla guy and I love chocolate. 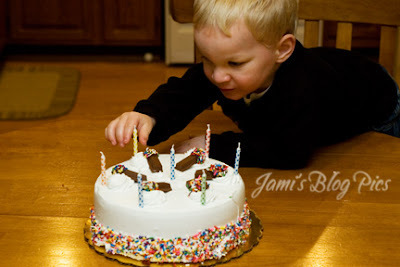 Zack couldn't resist the sprinkles and candles. 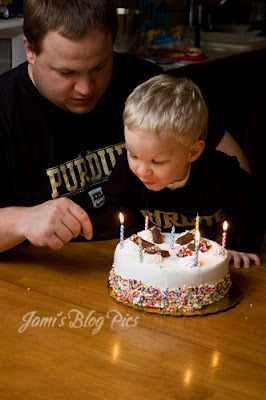 Zack blowing out the candles. Notice that Ryan has a different shirt below than he did in the above picture. Addie spit up on him so he took off his shirt and had on a white undershirt. I asked him to put on a decent shirt for pictures and of course he mumbled something negative under his breathe, then he came out of the bedroom with a bright red and blue Hawaiian shirt on. I should have known better! Thankfully he took it off and put on a wardrobe staple Purdue t-shirt. Happy Birthday Ryan! I love you!! Yes, she is cute even though she is crying! :) Funny about the shirt! Hope Ryan had a great birthday! 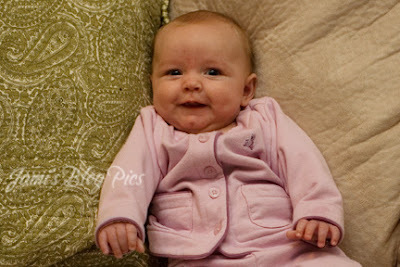 She is getting so big and as usual she is adorable (even when she cries). Hope your hubby had a great birthday, that cake looks yummy!